The iRECADATA wifi SSD is a crystallization of innovation .It does jobs well that traditional solid state drives did .And it is mixed with many other creative functions at the same time . The highlight of this SSD is the Wireless Storage Way .It supports muti user accounts and you can also add a pass word for your own account for safty encryption . More ,the function of photos/videos cloud storage and sharing is fairly suitable for youths .You can record every moment of your life and show the best yourself to your friends .That's really cool .You will love it ! HIGH CAPACITY AND SPEED : 256GB Internal SSD-level performance with highest grade NAND Flash MLC.Up to 5gbps speed for data transfer with USB 3.1 . WIRELESS SYNC STORAGE : Except the traditional wired connectivity ,it also supports wireless way to storing via iRECADATA APP .Photos and videos can be saved to the I7 SSD automatically and you can share them to your social communication tools like facebook ,instagrm .Also other important data and documents can be one-key backup to this solid state drive with your cell phone and other devices connecting to its WIFI . AIR SHARING OTG : Easy to view and move files on the go to TV at any time like music ,video and photos . WI-FI ROUTE RELAY : It can be used as wifi repeater to extend your home wifi distance . 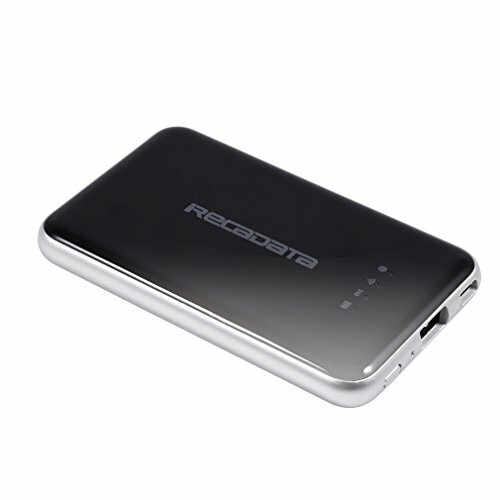 PORTABLE POWER BANK DESIGN : It has a mini size about 10.5*6.5*1.5 cm ,which is super portable for people on business .Still ,buit in 2250 mAh battery ,it can be used as a power bank for mobile emergency charging .